Fort Bragg is the home of The 82nd Airborne located just west of Fayetteville, NC. It covers over 251 square miles in four counties. Ft. Bragg is fortunate to have some of the nation’s finest fighting men and women located right here! 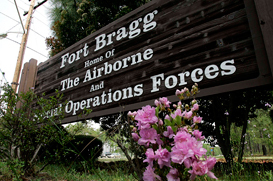 The fort is named for Confederate General Braxton Bragg. . Today, Fort Bragg is the world’s largest airborne facility with more than 45,000 military personnel. Fayetteville & Sanford are very proud of their Military Heroes. Our Realtors are Military oriented and specialize in Military Relocation. People from all over the world are moving to this area! We have wonderful schools, friendly people and the perfect home for you!